On a recent playthrough of Castlevania: The Adventure, I tried to complete it with one rule that you could probably apply to all other games in the series. It's a simple rule - Do not destroy a single candle unless it's required. The only time you are required to destroy a candle in this game is when you've reached the end of a stage and need the boss to appear. Candles are a prominent element in the series. 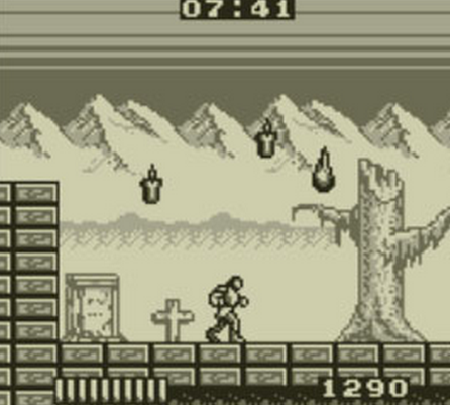 When destroyed, they reveal beneficial items and power-ups. During my "No Candle" playthrough of The Adventure, choosing not to destroy candles denied me from getting two advantageous items. The first were orbs that upgrade the power and range of your whip - the one and only weapon in the entire game. At its weakest, the whip is short, and killing enemies with it requires more hits. Naturally, these two handicaps made the game more difficult because I was constantly playing in an underpowered state. The second item were hearts. Hearts are a staple in the series, but they function differently compared to many other video games. In other games, hearts heal you. In the Castlevania series, hearts act as ammo for your sub-weapons. Since the whip is your only weapon in The Adventure - the game removed sub-weapons entirely - hearts restore your health instead. Not being able to restore my health at all meant that any amount of damage I took would be permanent. This made my playthrough feel like an endurance run as I tried to salvage as much health as possible before facing a boss. However, that endurance run eventually ended in frustration. I was able to complete the first two stages out of The Adventure's four (there is a fifth one but it's just the first one only tougher) without much trouble. Despite being underpowered, I felt like the game wasn't impossible until I reached stage 3, where my playthrough came to a halt. Anyone that has played The Adventure knows that stage 3 is the most difficult and possibly longest stage in the game. There are spikes throughout it that will instantly kill you, and enemies that will get in your way and slow you down so those spikes can reach you. The first portion of this stage is when having the basic whip is a significant disadvantage. It contains a spike-covered ceiling that slowly descends, forcing you to keep moving. Stopping even for a second will get you killed so your timing has to be perfect. To stop the ceiling from killing you, you have to destroy a spinning screw - one of several - that is connected to both the ceiling and floor and is blocking your path. With an upgraded whip, it just takes several hits and isn't much of a problem. Without the upgrade it requires eight hits - barely enough time to destroy it. There were many moments where I destroyed it but then died as the sprite began to fade away. So close. Eventually, I got past it but died at the stage's boss. I left all of the candles in the game untouched and lit, but lost all of my lives. I can get to stage 4 on a normal playthrough but not with the single stipulation of the No Candle challenge. What I learned during this playthrough was how much I relied on The Adventure's candles to provide me with advantages on my quest to kill Dracula and how the difficulty of the game changed simply by ignoring them. I didn't make the game harder by changing the difficulty within a menu, I made it harder by choosing not to interact with a ubiquitous and useful element throughout my adventure. Written for the Blogs of the Round Table. Read more about games and rules created by its players below. Also check out other great work at Critical Distance.